I haven't really looked at the website since it first launched, let alone in detail to point out flaws. Didn't know they had a map, honestly. As for why is the "black" Cleopatra in Civ Rev, I'm not saying it SHOULD be, but don't have a problem with it. They could put in blue skin and hot pink hair for all I care. I'm guessing it's either purely artistic license, whoever made it favors that look, or for balance, as previously stated. No, adding another civ in really isn't an option, that's more work. Here they can get a black looking female leader in, and have plenty of precidence to site as sources of inspiration for that decision. Probably somewhere between those two. "likely", "similar", "diverse". You're already saying yourself you have no clue as to what she looked like, but Firaxis is supposed to magically have the answer? What you consider to be the 'correct' look for Cleopatra is highly biased, entirely speculative and almost certainly very inaccurate, just like Firaxis's depiction of her. What's the difference? You're welcome to disagree with Firaxis but your reasoning is no more valuable or valid than theirs (whatever that is, we don't even know), you're making a big stink over nothing. It's not like Firaxis will have had hour-long meetings over this puny little issue, it was almost certainly at the discretion of the one artist who happened to be assigned this leaderhead (who undoubtedly did some research but (s)he didn't make it his/her master thesis, (s)he did probably have like 3 other leaderheads to make before the next deadline). So first you say both are equally likely and then you say one just doesn't cut it while the other is the only correct view in your book? Sorry, you're not making any kind of sense here yourself, certainly no more than Firaxis. Your cultural background affects your world view. A black African is more likely to view Cleopatra as black, a white American will likely cosider her white, etc. We REALLY have NO CLUE as to what she looked like so how you (and I and everyone else) view her depends on what kind of books you've read, places you've been, movies you've seen, etc and all kinds of other life experiences. She looks different to different people depending on their cultural background because we can all only speculate about her appearance (and there has been plenty of speculation over the centuries). On the second point: In any case go to the CivRev site and go to the civ section, there you have an option to see them on the map. Also why the hell should they care about a leaders race? It should not! The reason we wanted more african civs in previos civ versions was because they were interesting and because Africa was too empty on the Earth map, not because the civs had black leaders and we felt the need to make civ politicaly correct. Last edited by Heraclitus; April 5, 2008, 09:19. Looking at the map, they didn't just place him in Africa, but in Egypt specifically, which is actually the historically correct thing to do: in popular Western culture many people only know Saladin as the guy who fought in the Crusades in the war for the Holy Land, but in reality that was only a tiny insignicant chapter in Saladin's life. In reality he was Sultan of Egypt, his main power base was in Egypt and Cairo was his capital and the location of his main palaces. In fact, he effectively made Cairo the center of the Islamic world which it would remain for centuries (and basically still is today, although they're been periods Baghdad, Esfahan and especially Istanbul outclassed it). Most of his military conquests were to expand his empire base in Egypt: he conquered much of North Africa, the area bordering on the Red Sea (esp Yemen) and late in his life Syria, where he encountered Richard the Lionhearted and other Crusaders which made him so famous in the West. But that was not in any way a major accomplishment for him, even if both us Westerners and modern Arabs (who see him as a hero in the struggle for Palestine) want to see it that way. You can still see Saladin's Egyptian roots today: Egypt's modern coat of arms is the Eagle of Saladin. So here Firaxis (or more likely 2K, who maintain that site from what I can gather) actually did do their homework and did what's historically accurate and not what most people would expect, and yet you still fault them for it. They just can't win with you, can they? Locutus your explanation, while tehnically plausible, is a bit far fetched, since firaxis is probably just going by where the civs are not where the civ leaders come from. Why else would they put Chatarine in the depts of Eurasia (beyond the Ural) and not closer to a center of her power or where she was born ( )? You are forgetting that CivRev only has one leader per civ, the leader is the civ in some sense. My position on this is further supported by the fact that the part of the website we are looking at is labeled "Civilizations" not "Leaders". Also beneath the name of each ruler is the name of the country under Saladin it says Arabia. It also does not explain the odd placement of the Aztec, Zulu and Mongolian leaders. On a final note Saladin seems to be placed very south in Egypt, I'm willing to bet well south of Cairo. Damm, talking to you is like arguing with a church apologist. Last edited by Heraclitus; April 4, 2008, 08:12. It does mention "North Africa" ever so breifly, there is however no mention of Egypt or how it was his power base. Why not make a reference to it in the civilopedia if it was realy their intention to be historicaly correct about "leader" (and incorrect about civ) placement? Last edited by Heraclitus; April 4, 2008, 08:21. They didn't put Saladin where he 'came from', as he was actually born in present-day Turkey somewhere I believe (he's a Kurd), they put him where his empire was: he ruled Egypt, Yemen and a small area of the Arabian peninsula, North Africa and parts of the Levant, with Egypt as his base. It's the same reason Caesar is in Italy, as Italy was the centre of the Roman empire, much as it controlled the entire Mediterranean basin. The Arab civilization however was never a unified empire like the Roman one, it was very much splintered in different factions with different sultans ruling over different parts of what us ignorant Westerners consider to be the 'Arab Empire' and actually competed with each other and fought over territory, much like the European kings did in Europe -- if you really want to mimic history accurately, having one Arab civ really makes about as much sense as having one European civ. There were different factions, different dynasties and different states which constantly changed over time. Saladin was the founder of one of these factions/dynasties (the Ayyubids) and his kingdom (the Ayyubid Empire) was based around Egypt -- he never ruled over most of the Middle East as we think of it when we think of the Arab 'empire' or 'civilization': he never ruled over present-day Iraq, Iran, Israel (+ Palestine), Turkey, most of Saudi Arabia and only had brief control over Jordan and Syria. He was really the Sultan of an Egyptian kingdom, not the leader of some grand Arab empire -- that never existed. And yes, that map is off on a couple of points: all the leaders in the Med basin are a little off to the south which must be a bug of sorts (Caesar is in Southern Italy rather than Rome, Cleopatra is in the area around Luxor when she should be in Alexandria, Alexander is in Athens when he should be in Macedonia and of course Saladin looks like he's in present-day Sudan when he should be in Cairo or central Egypt) and some of the others like Montezuma are off by quite a large margin as you pointed out yourself. But you're really nitpicking over ridiculously obscure details here: this is a promotion website for a game, not some detailed scientific model that's the result of years and years of study, someone didn't earn their master's thesis in ancient history on this. That text entry I have to say is exceptionally poorly written, but to be honest most of the Civilopedia in most Civ games are (in fact it wouldn't surprise me if it was copied directly from the Civ4 Civilopedia -- I would be surprised if it was made by the same person who made the map). These games and websites are not made by history majors (I came up with a lot of the historic stuff in Civ4 and my background is in Computer Science, just like most Firaxians), they provide you some historic flavour but if you really wanna learn about history there's no substitute from getting out and buying some real books. I never said he came from the ther , please don't put words into my mouth. In fact in the up and coming polycast I explicitly mentioned he was of Kurdish descent. Disagree, the differences betweeen lets say Russia and England are far bigger. Firstly the language barrier, secondly religus division, thirdly no common origin. Now the Dutch and Germans or even the Portugese and Spanism may be more in line with your argument, but not the entire contient. Not by a long shot. Under Muhamed. Granted it was not quite "grand" but it was pretty unified and it represented the common origin. In Europe we don't have that we have Romanic, Germanic, Slavic and Celtic peoples. If I rember you said Firaxis couldn't win with me, and now you recognise the innacuracies yourself. Also I can quite confidently say, there is no bug. They put Alexander in Athens and Egyptians in Cairo because that is what people percieve as the heart of those civs. You completley skipped my argument about how a single leader "is" a civ. And there is no need for years of study, it is farcical to claim so! All I want is consistency, either go with the "heartland" of the Civs (as in the case of Greece and France and Egypt) or have realistic cores of power according to what they were in the time of the leaders rule. It is very easy a high school student with a B in history could all of those right in one try. Yes they are a direct rip off of Civ4's civilopedia. And yes civ is not a source of info. But I do expect some minimal standard, something that a 9 year old kid could use without his teacher pointing out blatant inconstencies. You are arguing quite strongly for a very weake cause. It would take like 15 min to move those little circles and fix the darn website! I'm merely quoting your own post: "since firaxis is probably just going by where the civs are not where the civ leaders come from". The differences between Arab factions are the same, or very similar to, the differences between European nations. There is no common Arab language, it's really a family of strongly deviant dialects. If a Moroccan, an Egyptian and an Iraqi met and wanted to have a conversation they couldn't, they wouldn't be able to understand 90% of what the other guys were saying, much like if an Englishman, a Norwegian and a Bulgarian came together. The religious divisions are there as well: some dynasties were Sunni, some Shi'a, some Sufi, etc. These religious differences are actually considerably larger than the differences between Anglicans, Catholics and Othrodox Christians. And Moroccans, Egyptians and Persians have no more common origins than Germans, Romanians and Spanish. In fact, if anything there is more variety in the heritage of the different 'Arab' peoples than with Europeans: at least 90% of Europe was once part of the Roman empire, or fell closely within its sphere of influence, and that fact still forms the basis of modern European culture. There's no such common heritage in the Arab world. Under Muhammad the Arab 'empire' was a small desert kingdom, it didn't even encompass half of present-day Saudi Arabia, that's not an empire by any stretch of the definition. It didn't grow into an empire until after his death, but that's also immediately where the first rift between different factions was born. Virtually all of the Romanic, Germanic, Celtic and a major portion of the Slavic world was either Roman or fell closely under the Roman sphere of influence (and in case of the Slavic world later was very closely tied to Byzantium, if you consider that to be separate), and present-day European culture from Iceland to Russia and from Finland to Spain is still very heavily informed by this heritage (by the fact that they're all Christian nations alone). But no, neither the Arabs nor the Europeans were ever a unified empire, which is exactly what my point was (although on this point I wasn't talking about Europe at all). If I rember you said Firaxis couldn't win with me, and now you recognise the innacuracies yourself. Yes, both are true. There are minor inaccuracies in the map, but when they DO get things right, like by putting Saladin in Egypt rather than in Iraq or Saudi Arabia or whatever other unhistorical place you'd put him, you still fault them for it. Also I can quite confidently say, there is no bug. They put Alexander in Athens and Egyptians in Cairo because that is what people percieve as the heart of those civs. How can you say that confidently? Did they tell you that, did you invent a mind-reading device? You are merely speculating based on ill-informed arguments, which isn't much more than I'm doing but at least I don't pretend differently. The fact that ALL Mediterranean civs are off by the EXACT same amount of pixels in the EXACT same direction smells very strongly like a bug/design error, not a deliberate design decision. As a programmer and web designer I've made these kind of mistakes myself plenty of times, it's really not uncommon. You completley skipped my argument about how a single leader "is" a civ. Well, you can't get it right either: you're misinformed about Saladin and Cleopatra, and if we'd talk more I'm sure you have misconceptions about plenty of other civs as well. Nobody's perfect, not you, not me and not Firaxis either. Don't hold them to higher standards than to ones you can hold yourself. Last edited by Locutus; April 4, 2008, 14:36. Again, please stop misrepresenting the situation, I am really tired of you doing that. You perfectly understand what I mean, but have taken advantage of the unintentional ambiguity of the original comment. Take a look at this sentence, I used “where they come from” as “country of residence”, the place they are associated with. If someone was born in Paris and went to live in London at the age of 9, they he would later in life become the mayor of London, would you say when introducing him “This is Smith he comes from Paris.”? I admit it is a poorly formed paragraph, I am not a native speaker, I’m Slovenian. But I suppose I have no excuse right? You are convinced that anyone who speaks Slovenian or Bulgarian can be understood 90% by an Englishman, right? But if I get back to it, if I had meant “where they come from” as in “where they where born” or “where they spent their childhood” the second part of the paragraph would have made no sense. The one referring to Catherine’s place of birth with the smiley (since placing her there would just confuse the hell out of some people). at least 90% of Europe was once part of the Roman empire, or fell closely within its sphere of influence, and that fact still forms the basis of modern European culture. There's no such common heritage in the Arab world. That combined with the "sphere of influence" as you termed it is not even 50% let alone 90%. You know there is a reason why the Romaic group is called Romanic; because it has strong ties to Roma culture. French, Spanish, Portuguese, Italia and Romanian all derive from Latin which fractured into many languages during the middle ages. The Celtic world is mostly lost to us since it was gobbled up by the Germanic language group and the Romanic one. Its only remaining fragments are minorities in the British Isles and in France, Brittany (called that for a reason since the people there actually came from the British Isles, the Celts who lived there before the Romans came were completely assimilated). So considering this it is no wonder their culture is similar! They have lived under these two groups for millennia! 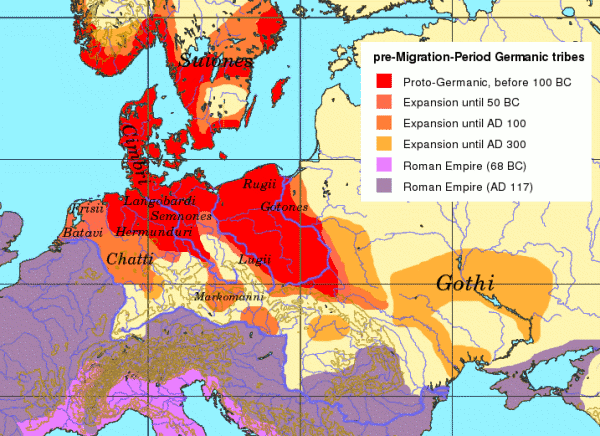 The Germanic group was never under predominantly Roman influence! Sure Holland and places like Western Germany, Switzerland and Austria were, but places like Scandinavia never hear of the Romans. Slavs only ever had contact (which we know of since it is possible some ot the Eastern European people the Romans encountered were Slavs) with the Byzantium! A entitiy which is best described as Greek. That is why eastern Europe mostly uses a different alphabet (derived from Greek) than its western half (which uses a Alphabets derived from the Roman one). (by the fact that they're all Christian nations alone). Indonesia has the largest muslim population on the planet, this does not mean it is part of the "Arab world". All of the converting of Northern, Central and Eastern Europe was done by later Christian states not Rome. In fact many lands that were once part of the Roman emprie had to be converted all over again after pagan peoples displaced and assimilated the Romanic population. Also the reason other parts of the empire retained Christianity was either because the barbarians that arrived (like some of the Gothic peoples) were already Chirstian (altough heretical Christians, by Roman standards) or because they were governed by the Byzantium Empire. Last edited by Heraclitus; April 5, 2008, 09:18. I'm not misrepresenting anything, I used the EXACT same LITERAL phrasing you used (I even used quotation marks to emphasize that), how could that be misrepresenting? And no, I actually didn't understood what you meant, or I wouldn't have addressed it. That is not even 50% let alone 90%. Only the very sparsely-inhabited far-north and most of the Soviet Union territory were basically not under Roman influence, but most of the people living there today are immigrants from the Balkan region (Slavs) or from Central Europe (Germanics) where Rome's influence was quite significant. You'd have a very hard case to make if you say Roman culture is NOT a major influence in modern Scandinavian and Russian culture -- Moscow has always claimed to be the Third Rome, their leaders long called themselves Tzars and the Russian Coat of Arms is a carbon-copy of the Byzantine one, they inherited their Orthodox religion from the Eastern Roman empire, Latin has had a significant influence on the Russian language, Russian art, architecture, morality, etc all have strong Roman influences, etc. Scandinavia is probably the least 'Romanised' part of Europe but in terms of language, religion, culture, etc they still derived much from Germany and Central Europe and copied the Roman influences from there. Yes, European culture has evolved a lot over the centuries and there are large differences between Icelandics, Russians and Greeks, but there are also a lot of similarities. But my whole point is that the SAME trends exist in the Arab world. The difference between an Englishman, a Spanish and a Czech is no smaller than the difference between a Moroccan, an Egyptian and a Persian. I've been to all of those countries (well, except Iran), met all of these people (including plenty of Iranians) and studied their histories, cultures and languages (except for Farsi and Czech): just because they all look brown and speak gibberish to us doesn't mean they're all the same. Last edited by Locutus; April 5, 2008, 07:54. Only the very sparsely-inhabited far-north and most of the Soviet Union territory were basically not under Roman influence, but most of the people living there today are immigrants from the Balkan region (Slavs) or from Central Europe (Germanics) where Rome's influence was quite significant. Ok, I am sorry but this is blatantly wrong. You are confusing cause and effect among other things. The peoples in those regions acquired elemnts of Roman culture from their brethren who had migrated to former Roman territories or by peoples of other barbarian groups who had accepted elements of Roman culture. It didn’t happen the other way around (Romanized barbarians migrating to those regions). Fortunately this is not the case I am trying to make. I would kindly ask you something but I have been doing so the entire thread and I see little purpose in repeating myself. And on a million other languages, many outside of Europe. If not by any other means then by many international scientific terms. Were all these languages in the sphere of influence of the Roman Empire? Also the influence of Latin on the Russian is not that strong. Russian art, architecture, morality, etc all have strong Roman influences, etc. And Indonesian art, arhitecture and morallity all have such Arab influences. You are arguing against grouping together “the Arabs”, and the arguments you try to use to prove this by comparing them to Europeans, indicate they are grouped together but not only amongst themselves but with Persians, Pakistanis and Indonesians. But to be serious those are the influences of Islam, just as similarity in the Western world mostly stems from Christianity. BTW Christian values were quite different than the values of “proper” Romans. Scandinavia is probably the least 'Romanised' part of Europe but in terms of language, religion, culture, etc they still derived much from Germany and Central Europe and copied the Roman influences from there. See my many above points. We are talking about Arabs as in Saudies, Palestians and Syrians. You are trying to win the argument by misrepresenting my position! You are simpley expanding the region I supposedly claim should be one civ! I never grouped the Persians or Turks with the Arabs! And BTW they have their own civ. They are diferent to an extent just as Russians and Belorussians or Ukranians but we only have a Russian civ because they are too similar despite their relativley large size. And on a last point. Egypt is already a civ, the civliopedia of Civ3 and 4 describet their history all the way to Naser. Despite a change in language and several changes in religion and a complete change of the society. Identify with Ancient Egyptians as strongly as Italians with the Romans. They aren’t Ancient Egyptians, but the Italians aren’t Romans either. And in civ we don’t have Italy since they are too similar and start in the same spot. So the Arab Egyptians already have a seperate civ. Last edited by Heraclitus; April 5, 2008, 08:40. The "Arab World", personaly I would not include some states in western North Afirca, nor most of the Sudan. Not true. Sladin did not rule from the Sudan. If they had put him in Egypt I would have been the first to applaud them, if they had gotten other less obscure stuff right as well. I mean the Aztecs? Dosen't firaxis know where Mexico City is? If you know nothing else just aim for that when placing the Aztecs and I will swallow it.